So, you’ve already taken that first critical step toward getting your email marketing program off the ground by building your contact list, and now you need to send your subscribers…something. But what should that something be? 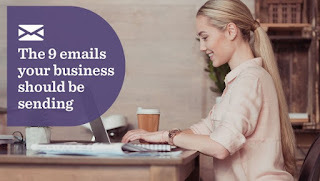 If you’re struggling to figure out what to send or how to keep your customers engaged, rest easy — we’ve highlighted nine emails your business should send on a regular basis, along with a few tips on creating them. We’ll also tell you, on a scale of 1 to 5, the difficulty level for each email. The closer the number is to 5, the more effort it takes. Purpose: To promote a product or service, usually to entice customers to make a purchase. Business that would benefit: Every business. Difficulty level: 1 — Promotional emails are short and sweet. You might want to create a special graphic to complement your email copy; otherwise, it’s not a time consuming process. Make the offer clear. Your customers may not take the time to read your email, but if you have a clear offer that’s front-and-center, they won’t be able to ignore it. In the promotional email below, there’s no question what the deal is. Keep it short. Promotional emails don’t require a lot of explanation. State the deal, then tell customers how to redeem it before it expires. No need for a lot of flowery words. Take a look at the example below. In less than 45 words, the retailer sums up the deal. Purpose: To let your customers know about new items. It falls under the promotional email umbrella. You’re updating customers, but also hoping for a sale. Business that would benefit: Any business can tell customers about a new item in stock. Fashion and retail businesses may get the most bang for their buck. Difficulty level: 2 — Time is spent taking a good picture of the new product, but these don’t require a lot of text. Send the email out as soon as the item arrives. As soon as you have the inventory in stock, create the email and hit send. This shows you’re on top of new trends and want your customers to have the latest, greatest items available. Take a killer picture. You don’t have to get artsy, but you do need to showcase your new item. In fact, these types of emails are more about the photo than text. Take the email below, for example. It’s all about the picture. With just a few words, Nike gets its point across. Purpose: To inform customers about company news, improve brand awareness and build a relationship with your core audience. Difficulty level: 3 — It takes a bit of time to create a solid newsletter, but it’s a valuable marketing tool. A newsletter doesn’t mean long format. Break the copy in your newsletter into short, digestible and actionable sections of content, copy, images and calls to action. Purpose: To welcome new email subscribers to the family and establish a good relationship. Difficulty level: 2 — Creating the email doesn’t take long, but you need to know when a new customer signs up. Write in a conversational tone. A welcome email is like a virtual handshake that accepts a new member into your group. It should be inviting and warm. Show the personal side of your business. Take a look at the email below. It specifically welcomes new subscribers into a community, and the tone is friendly and casual, but still professional. Consider offering a reward. In celebration of a new customer, you could offer a discount or some sort of perk. You could offer 10 percent off the next purchase like Society6 did in the example above, or offer another perk like free shipping. Remind new users about the benefits. Thank your new customers for signing up and reinforce their decision to join. Tell readers what they’ll get out of this new partnership. The email below does exactly that. Purpose: To offer your customers advice on how to get the most from your business or product. At the same time, you establish your authority in the industry. Difficulty level: 3 — This kind of email has more information, so your time will go toward writing and proofreading. Create valuable content. The key to this kind of email is to offer tips that your customers want to read. Help solve problems they may have or obstacles they may need to overcome. Or, offer tips to help your customers use and maintain your product or service. If you sell cameras, send an email that teaches customers how to use certain features. If you sell bathroom fixtures, include installation tips. Whatever your business is, create an email that gives your customers a helping hand. Babies “R” Us sent the following email to its customers to help them prepare for summer travels with their children. Proofread. No matter what email you send, you should proofread it several times. Read it from the bottom up so your brain isn’t reading words that aren’t there. Then, have someone else read it. Take it through an error-check process before sending. Nothing cuts your credibility like misspellings and grammatical errors. Focus on customer service. Emails that offer product tips should also showcase your commitment to customer service. Emails like this tell customers, “We’re here for you.” Follow through with that message by adding contact information to the email. The email below, for example, offers tips to wear a certain piece of clothing, but you’ll also notice there is a “contact us” option in the top right corner. Purpose: To provide customers with industry knowledge that’s connected to your business or product. It helps build relationships and trust between your business and your customers. Difficulty level: 3. It takes time to brainstorm ideas and to create a sharp email. Offer relevant content. When you send an educational email, you’re trying to build a relationship with your customers. The best way to do that is to teach them something. However, you want to teach them something that has a connection to your business. For instance, Monster.com, the job search site, sends its customers information about life in the workplace. An example is below. Consider offering bite-sized information. Take a cue from the Monster.com email above and write bite-sized pieces of information in the article; let your customers decide if they want to read more. The “Read more” link takes your customer to your blog for the full article. It’s a great way to engage with customers via email and boost blog traffic. Add a mini-promotion. You can add a promotional element to this kind of email, but it shouldn’t be the main attraction. For example, Lumosity, the brain game site, offers an educational article as the main feature, but notice a promotion on the right side for a family membership. It’s subtle and simple. Purpose: To remind customers that it’s time to reorder a certain product. Business that would benefit: Any business that sells products or services needed on a regular basis. Examples include products like printer cartridges, contacts, pet medications and vitamins. Difficulty level: 3 — Basic text and images are needed. Clear call to action. The purpose of a reorder email is to encourage your customers to replenish your product or perhaps renew a subscription for a service. You want to make the buying process as simple as possible. To do so, create a simple, easy-to-find button that says, “Reorder now.” For instance, in the example below, customers can reorder pet medication from Pet Wellbeing. Remind customers of the value. In the email, tell your customers why reordering is a good idea. Maybe it’s to keep vital pet medications on hand, or to avoid the hassle of running out of toner at the office. You could also offer a discount to those who reorder within a certain time frame. Mention past purchases. If you want, you can mention in the email what your customer purchased in the past, so they can reorder the same thing. The pet supply store below does this for its customers. It’s a nice addition to the email, but you can send it without this information. Purpose: To reinforce how valuable your business or product is through customer feedback. Difficulty level: 4 — It takes a bit of time to collect testimonials. You may need to be persistent to get customers to give them to you. Create a sleek design. Email design elements are important with testimonial emails. You want something that’s eye-catching and easy to read. Take a look at the example below. This retailer put together four quotes from happy customers and highlighted the product, too. It’s a win-win. Both the accolades and the products are showcased well in this simple design. Include an image. If you sell tangible items like clothing, using pictures of shirts and dresses makes sense. But that doesn’t work for every business. Take a medical clinic, for example, or a sanitation company. What image do you use in these cases? If you need a powerful image, ask the customer who gave the testimonial for a picture. Take a look at the example below. The customer’s picture is what makes the email work. Offer more information. A testimonial is great, but you should offer your customers a next step. For example, in the email above, customers can read more testimonials by clicking on the text. You could offer a link for others to leave feedback, or a link to other uplifting company news. Purpose: To collect helpful information you can use to improve the customer experience. Businesses that would benefit: Any business looking to better itself. Difficulty level: 4 — You’ll have to spend time creating the survey and writing an email with a link to the survey. Explain what’s in it for them. If you want a customer to take the time to fill out a survey, you need to give them a reason. In the example below from CVS, participants are entered to win a cash prize. Address the purpose of the survey. Besides an incentive to fill out the survey, you should tell your customers why you want the information. Whether you’re trying to improve your business or conducting product research, let your customers know the purpose of the survey. Make the survey easy to access. There should be an obvious, clickable link to the survey. Take a look at the example below. Notice the link to the survey is a clear, easy-to-spot button at the bottom of the email. 1. Ask the right questionsMake sure the questions you ask will yield helpful results. Stay on topic and reword questions, if necessary, to make sure they are understandable. 2. Keep it shortIf a customer gets bored with your survey, they’ll stop filling it out. Aim for a five-minute survey to ensure customers make it to the end. To keep your brand top of mind for your subscribers and encourage them to do business with you, it’s important to stay in touch. Varying your content by incorporating each of these emails into your marketing program not only makes those messages more compelling, but it also shows the breadth of what your company or organization has to offer.